DUBAI, Aug 5 (Reuters) – Etisalat, the Gulf’s biggest telecommunications firm, has kick-started a stalled acquisition strategy with a potential $10.5 billion in deals, including a $5.5 billion stake purchase in Morocco, its biggest buy ever. The United Arab Emirates company seems determined to avoid past mistakes, where it sometimes overbid for foreign operators or bought minor holdings that gave it no say in how an affiliate was run. Gulf Arab telecom operators like Etisalat and its Qatar-based rival Ooredoo are on the prowl for assets outside their relatively small and saturated home markets, where rising competition has pressured profitability. Since the start of 2011, Etisalat has overhauled management, withdrawn from India and sold most of its stake in Indonesia’s PT XL Axiata, reducing its footprint to about 15 countries across the Middle East, Africa and Asia. “There has been quite a lot of changes at Etisalat over the past couple of years to equip the company to cope better with the challenges of being a large international organisation,” said Matthew Reed, a senior analyst at Informa in Dubai. Some analysts had expected Etisalat to retrench further by trimming its operations back to those in high growth, large population or wealthy markets. 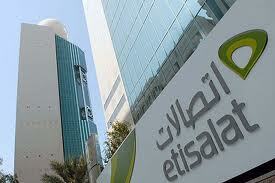 Etisalat’s domestic market accounted for 64 percent of revenue in the second quarter. But with a renewed mandate from its majority owner, the state-run Emirates Investment Authority, to expand abroad, and having packed the executive suite with fresh foreign recruits, Etisalat seeks to both expand and consolidate its existing portfolio through acquisitions. Etisalat, which spent about $12.6 billion between 2004 and 2009 buying companies, licenses and other investments, is now on the brink of its largest acquisition ever – a $5.54 billion deal to buy Vivendi’s 53 percent stake in Moroccan operator Maroc Telecom. Unlike some of its previous investments, the company has been careful on price, offering 92.6 Moroccan dirhams for the stake, a 7 percent discount to the operator’s closing price on July 22, a day before Vivendi said it was holding exclusive talks with Etisalat. Etisalat’s Chief Strategy Officer Daniel Ritz said in July that the company was looking for opportunities to bolster its existing portfolio of companies through acquisitions. By beefing up its existing portfolio, Etisalat is mirroring a strategy employed by its Gulf rival Ooredoo which has spent about $3.9 billion since the start of 2012, increasing its stakes in some foreign units, taking majority control of Iraq’s Asiacell, while it now owns 90 percent or more of Kuwait’s Wataniya and Tunisia’s Tunisiana. Etisalat, the largest telecoms firm in the Gulf by market capitalisation, may raise its holding in Saudi Arabia affiliate Mobily, its chief executive said last year. A Middle East telecoms banker, speaking on condition of anonymity, said a stake increase in Mobily could well be on the cards after the company closes the Maroc transaction, although such a move would be expensive with Mobily’s shares up 21 percent year-to-date and at a six-year high. Based on current market price, Etisalat may have to shell out nearly $3.9 billion to gain a controlling stake in Mobily. “It makes a lot of sense to have more control and say in your international business. Mobily is a good business and increasing ownership there could be a positive move. We could also see them make a move in Egypt where there are talks of a fourth license and potential consolidation,” the banker said. Egypt, the Arab world’s most populous country has three mobile operators including Etisalat. The other two are Vodafone Egypt and Mobinil, which is controlled by France Telecom. “The operator seems now more focused on making ‘appropriate and strategic’ investments that hold long term growth prospects,” according to Abhinav Purohit, an analyst at IDC in Dubai. Etisalat has also expressed interest to acquire rival Pakistan mobile operator Warid Telecom. Reuters had reported that it had hired Goldman Sachs Inc as an adviser for the potential acquisition worth up to $1 billion. In 2006, Etisalat paid nearly double that of the nearest bidder to buy a 26 percent stake in Pakistan Telecommunication Co Ltd (PTCL) for $2.6 billion. That stake is now worth $260 million in the market though the ownership also gives Etisalat management rights in the business. Etisalat still owes Pakistan $800 million as part of the original transaction. Yet Pakistan remains an attractive market for Etisalat – its 177 million people are yet to be served by 3G and data could be a big earner for operators. Adding Warid to the portfolio will give the company about 12.5 million new subscribers to its existing base and a chance to better compete with existing players such as Oslo-based Telenor and China Mobile. Etisalat does not plan to sell any of its international portfolio, according to Ritz, even though Etisalat had hired Deutsche Bank to potentially help sell part of Atlantique Telecom in 2011. “We are not in divestment mode. A lot of the legacy deleveraging issues which some other telecom companies face in the world do not apply to us,” Ritz said.